96 of 98 people found the following review helpful. My need was to automate turning on the exterior porch lights at dusk and off at dawn - for security purposes. Doing it manually is often forgotten and I can't really it do while away from home at night or on vacation. A home automation system was overkill and expensive. Putting in a light sensor switch on the fixture wouldn't work because the bulb is enclosed and can't detect dawn apart from the light itself. By chance I found this Honeywell timer. It does the job very well, blends in with the existing decor, has a number of programming options, and was easy to install with no rewiring. Details below. 1) Does your existing light switch have a neutral wire? Green or a bare copper wire is usually "ground" - ignore that for this purpose. If you only have 2 other wires on the switch, it's easy: you do not have a neutral. Otherwise you *might* depending on whether or not it is a 3-way switch. Generally newer homes (late 2000s) will have neutrals. See the user's manual on Honeywell's web site for a better description than I can provide. I made the mistake of not noticing the difference - don't do the same! I'm putting this review under both models that I purchased. 2) Do you want a simple device that turns on/off at a set time on each day of the week? Or do you want one with a larger back-lit screen, that can do dusk/dawn detection (based on longitude/latitude), and optionally turn it on/off randomly? Go for the "basic" or the "enhanced" depending on your answer (my words). 3) What color: almond (beige) or white? The disadvantage of the no-neutral version is that it is incompatible with solely energy efficient bulbs (no LED or CFL). Does *not* matter if you meet the minimum load (I confirmed that). It powers itself when the lights are off by bleeding small amounts of power - not enough to turn most traditional lights on, but causes others to flicker. But you *might* be able to make it work if you mix it up - put (1) 40W traditional bulb in with other sockets that have CFL/LEDs. 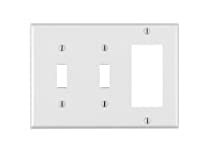 * Be sure to pickup a standard rectangular wall plate to go with it. Nothing custom here - same ones used for those larger paddle-style switches. * After reading the manual it took me ~20 minutes to install and setup. * The timer switch is deeper than a standard switch, so it was difficult for me to get all the wires into the box. It fit, but just barely. * Follow the manual for setting it up. It's easy to read and not difficult to do, but the process is not intuitive on its own. * The backlit model has 3 settings when sitting idle: on, low, off. When you press a key it goes to full brightness for 8 seconds. * You'll need the longitude and latitude of where you live for the enhanced model. There's a list of common cities in the manual, but if you live in a backwoods area you'll need to google it or use a GPS. It's nice to have this because it will adapt to sunrise/sunset automatically depending on the season. 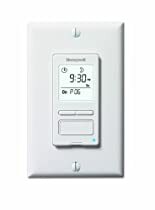 * It's very easy to override the timer - just press the big button light a normal switch. * Backup battery keeps your settings in the event of a power outage - nice! While this is the only timer I have ever purchased/installed/used...I can honestly say that this is a relatively inexpensive, easy, and functional home improvement project. I have two of these. One is installed to control the exterior lights out front of my garage, while the other is installed to control the light outside the front door. They both turn on at sunset...with the front door light turning off at 830pm...and the lights outside the garage turning off at 11pm. While as others have noted, the setup and use of the unit is pretty easy...the installation can be a little difficult depending on the depth of the electrical boxes installed in your home, along with how much wiring is already in there. 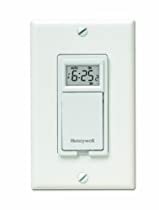 The Honeywell switch is much deeper and wider than the standard light switch, so you MAY have difficulty getting it to fit into the electrical box. I installed the the one in my garage first, which is a triple-gang box. The fit was pretty tight...but I was able to squeeze it in there by man-handling some of the wiring that was already in there. When I went to install the one controlling my front door lights, however, which was in a double-gang...I simply couldn't get it to fit, despite a liberal dose of cussing. After some research, however, I ordered an Arlington BES2 Gang Extender, which expands the box outwards by ~3/4 of an inch. Installation was MUCH easier with that additional space. I am uploading a picture of my timer with the BES2 installed for reference. As of right now, unfortunately, the BES2 is not available on Amazon. I purchased mine through Safemart for about $10. 66 of 72 people found the following review helpful. The fact that this requires a minimum 40 watt load should be featured more prominently in the description. That means no CFL and also no LED lamps, since neither of those will be over 40 watts in power consumption. It is not uncommon in timers, dimmers, etc. to find that they don't work with CFLs. But I've never before seen a product that won't control LED bulbs. You may not care about this for the present, but 5 years from now this switch may very well be useless.